This artist, who was probably born in Perugia, was first documented there in 1563. 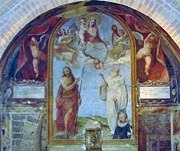 His earliest known work, which is signed and dated by inscription, is a fresco cycle (1579) in Santa Maria della Stella, Paciano. He enrolled in the painters‘ guild of Perugia in 1585. His last known work, which is signed and dated by inscription, is an altarpiece (1598) of Pentecost in the parish church of Castel Rigone. Silla Piccinini was documented in 1592 as a member of a team at work on the frescoes in the apse of San Pietro, in association with “Maestro Pietro”. Francesco Federico Mancini (referenced below) has shown in stylistic grounds that Maestro Pietro was almost certainly Pietro Rancanelli. Professor Mancini suggests that both men worked here under Giovanni Battista Lombardelli; that they followed him to Assisi, where they took over the decoration of Cappella dell’ Annunciazione in Santa Maria degli Angeli; that Scilla Piccinini took over the leadership of this team when Lombardelli died in 1592; and that he subsequently worked with Pietro Rancanelli at Palazzo Bonucci Baldeschi, Perugia. This panel by Silla Piccinini, which depicts the Madonna and Child with SS Fortunatus and George, was originally painted for the new high altar (1584) of San Fortunato. It is now on the back wall of the choir there. This fresco in San Manno was originally signed by Silla Piccinini and dated by inscription. It depicts the Madonna and Child in glory, with SS John the Baptist and Magnus, and a donor at the lower right. This fresco in the niche to the right of the Altare della Madonna in Santa Maria Nuova is attributed to Silla Piccinini. It depicts the standing Madonna and Child with angels, two of whom hold a crown over the head of the Madonna, and St Antony Abbot and the then uncanonised Philip Benizi below. As noted above, Silla Piccinini was among the team at work in the apse of San Pietro in 1592. ✴the figure of God the Father in the vault above. The frescoes (late 16th century) of scenes from the Old Testament on the ceiling of the sacristy are also attributed to him. The frescoes (late 16th century) of the Sala dei Legisti of Palazzo Baldeschi Bonucci, which are attributed to Silla Piccinini and Pietro Rancanelli, were commissioned after the death in 1567 of Filippo Baldeschi, the jurist who had built the palace and who had used this room to teach law. The scenes include depictions of 19 prominent jurists from the Baldeschi family, including Filippo himself and his most illustrious ancestor, Baldo degli Ubaldi. There is an image of some of the frescoes in the website of the Fondazione Orintia Carletti Bonucci, the current owners of the palace. ✴the gift of Monte della Verna to St Francis, on the right. The annual procession depicted in the first fresco is described in the page on the Sacro Velo della Madonna. The artist Antonio Castelletti is documented as restoring the frescoes of the chapel in 1828. A recent investigation has shown that the original fresco showed the basilica while it was still in construction (notably, without its dome), and that Castelletti updated it. This is thus an important representation of the situation before the earthquake of 1832. Return to Art in: Assisi Perugia.